A superior, absolute oceanfront corner unit condo with sweeping views of the surf and sunset. The living room, dining room, and bedrooms all have windows on the waves and the Poipu coastline. Where else on Kauai can you be this close to the waves? Whales, dolphins, and so many sea turtles can be enjoyed in their seasons from your couch! 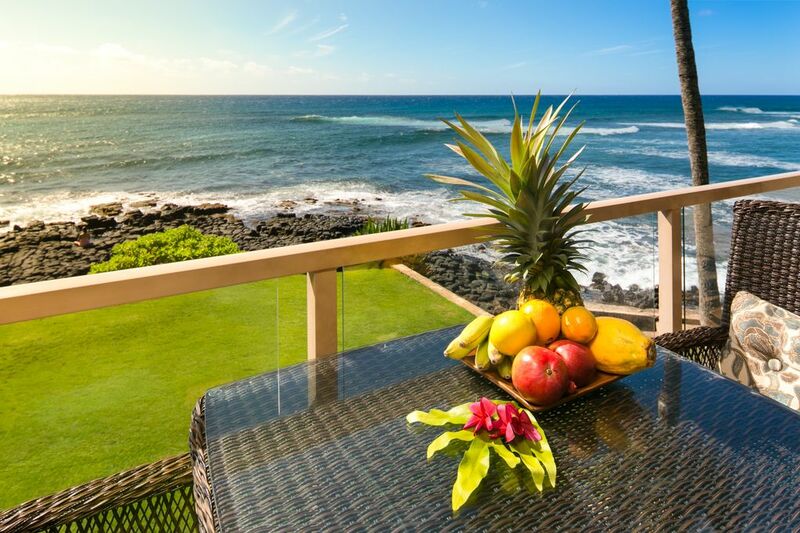 Tropical breezes caress you as you nearly touch the famous surf from your covered lanai. Some of Kauai's best snorkel, surf spots, and white sand beaches are all right here. A gorgeous lawn borders your view of the waves, lit with romantic tiki torches at sunset. This is the perfect place for a romantic getaway or a dream vacation! Our family has lived in Poipu for over 20 years and it brings us so much joy. A peaceful environment with outdoor activities surrounded by the best that nature has to offer! We are so thankful to call Kauai our home and are so glad to share our home with you! Surf, sunsets, and sunshine, all enjoyed in Surf Song. Guests agree that Surf Song is the "Best Location in Poipu and on Kauai" for its proximity to the surf and famous sunsets over the water. There is really no down season. Surf Song is usually booked solid throughout the year! A superior, absolute oceanfront corner unit condo with sweeping views of the surf and sunset. The living room, dining room, and bedrooms all have windows on the waves and the Poipu coastline. Where else on Kauai can you be this close to the waves? Whales, dolphins, and so many sea turtles can be enjoyed in their seasons from your couch! Some of Kauai's best snorkel, surf spots, and white sand beaches are all right here. A gorgeous lawn borders your view of the waves, the ocean, and sunsets! Marble shower and granite vanity with glass bowl sink. Second bath has a combination shower and bath tub with a separate vanity, sink, and closet area. The sand Lawa'i Beach is meters away. Surf and snorkel right outside the condo. The mountains rise out of the ocean. The dramatic, awesome landscape is what distinguishes Kauai, the oldest Hawaiian Island, from the rest, along with its lush surroundings. The waves crash within a few feet below the covered lanai. Poipu is a world-class resort destination with water and adventure activities, superior shopping and restaurant experiences, and serene spa and relaxation amenities. Expansive ranch lands throughout the south side of Kauai add to the peaceful, laid back culture. Old Koloa Town is the oldest town on the island, with a quaint history to enjoy. There is a fresh farmers market from noon to 1:00 on Mondays at the park on the way to the tree tunnel. Kukui'ula Village Shopping Center, our island's newest and best dining and shopping experience, is a short stroll from Surf Song. The closest condo to the surf on Kauai! Watch the snorkelers over the grass and sand beach. View the sand beaches down the coastline all the way to Palama Beach. Gorgeous clean grass is around this property with the sand beach in view and just steps away. The expansive views of the surf, ocean, endless horizon, and sunset will take your breath away! Absolute oceanfront! Look over many different surf breaks with surfers coming right toward you. Take in the famous sunset and coastline views to the Forbidden Island. This is unlike any other location! Air conditioning units in each bedroom provide a comfortable sleeping environment. Laundry facilities on each floor of the building. High-speed internet and secure WiFi in the home. Keurig K-Cup coffee maker with coffee pods provided, as well as a French press for ground coffee. Granite counters, modern stovetop, beautiful cabinets, and excellent appliances. You can see the entire ocean view from the kitchen! Lanai dining also for 4 when you add two bamboo stools from inside. See lobby to borrow books etc. The gorgeous lawn is yours to enjoy. Feel free to take your provided beach chairs and enjoy the sun. Stand up boards enjoy the harbor as well as swimmers and outrigger canoes. Our own Kukui'ula small boat harbor is a great place to hop on a vessel of your choice. The outrigger canoes are enjoyable to watch as they race just past the waves. Sunset sailing. Predictable sunny weather makes Poipu the mecca for tennis. Try calling the Kiahuna courts to schedule play. Enjoy a Range of local to PGA level courses, all in Poipu. Surf Song is so unique in its Prime Corner location taking in the surf and coastline view from every major room. So romantic is the setting and famous are the sunsets that weddings are often held on the grass near Surf Song. Tropical breezes are maximized with windows on every side and new fans to efficiently circulate them. Great view from the Lani watching surfers, turtles saw humpback whales. Walt was very gracious. We will be back. Place was great! Good location, well stocked, quiet and lots of fun activities to watch from lanai. Surfers, dolphins, whales, turtles and boats- so bring your binoculars! We’d love to come back! This was our second stay at Surf Song and we loved every minute of it. The location is fantastic - amazing views of the ocean, surfers, nearby snorkeling, and lots of stores and amenities nearby. The Condo had everything that we needed: a well stocked kitchen, very comfortable beds, couches and chairs, it is nicely decorated, and had beach chairs, bogey boards, a cooler, etc. Joy is delightful to work with, answering all of our questions in advance, and then checking in with us just to be sure everything was good (and it was!). We thoroughly enjoyed our stay and are already planning our return trip. This property is absolutely wonderful as is Joy and Walt the owners! We had the most wonderful month in their Unit 219. Sunset parties every night below, multiple weddings to watch and enjoy, turtles everyday, and humpbacks blowing and breaching. What more is there to say. The unit is well contained with great a/c. There is hardly any reason to leave your lanai as it is as the picture says, "breathtaking". We love the area as it has a great snorkel beach and of course the Beach House restaurant for Happy Hour! It was so great we tried to book for 2020, but it was all ready taken. If you want this great place to stay in Kauai, book sooner than later. Thanks Joy and Walt for everything, see you in 2020! HOPE TO RETURN - Perfect! Amazing in every way. Location, scenery, cleanliness, beach toys, new bedding (and comfy). Great kitchen and bathrooms. I think this is the only place I will stay when visiting Poipu area. Surfers, sunsets, sunrises.... all from the unit! Favorite island activities include: surfing, diving, snorkeling, swimming, floating, kiteboarding, bodyboarding, skimboarding, standup boarding, wind surfing, parasailing, whale watching, kayaking, boating, bird watching, walking, shopping, wildlife viewing, spa, and golf.